The James Webb Space Telescope is the scientific successor to NASA's Hubble Space Telescope. It will be the most powerful space telescope ever built. Unlike Hubble’s single monolithic primary mirror, JWST’s primary mirror is made up of 18 individual, adjustable segments that will be aligned in space. Webb is an international project led by NASA with its partners, the European Space Agency and the Canadian Space Agency. 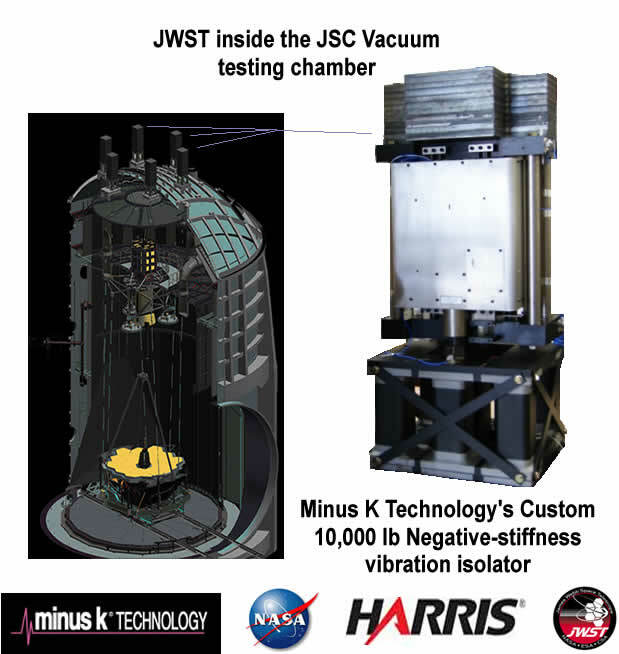 Minus K Technology, Inc. works with many aerospace and education laboratories for custom vibration isolation systems. They have manufactured custom vibration isolators for the Jet Propulsion Laboratory (JPL), German Center for Aerospace (DLR), European Space Research and Technology Centre/European Space Agency (ESTEC/ESA) in addition to the JWST custom isolators for the National Aeronautics and Space Administration (NASA).